#PollStrategy: Why ‘Swami Paripoornananda’ Contesting For Telangana Assembly Elections As BJP Candidate In ‘Kamareddy Constituency’? As the sun set over Kamareddy in Telangana, the town’s CSI Church Grounds bore a distinct saffron hue, as controversial Hindu seer-turned-politician Paripoornananda took the stage for his first political address since joining the BJP. The venue was decorated with massive flex hoardings which welcomed and hailed Paripoornananda, and showcased BJP’s MLA candidate Katipalli Venkataramana Reddy. Venkataramana Reddy hails from Demikalan village, from the neighbouring Yellareddy constituency. The Kamareddy Assembly constituency, known as an agricultural and trade oriented region, was once an epicentre of the naxalite movement. The CSI Church Grounds saw one side occupied by outlets selling fireworks ahead of Deepavali, with the rest of the venue left open for the gathering. A BJP volunteer at the spot said that over 20,000 people were expected to attend the meeting, from more than six mandals in the district. Shortly after, there was a commotion and Paripoornananda arrived. As he made his way to the stage, a handful of Brahmin priests chanted prayers. Portraits of Swami Vivekananda and Bharat Mata, placed on two chairs on the stage, were hard to miss. As the priests chanted hymns, the seer paid floral tributes to the portraits, before he spread his arms wide to the crowd, who began sloganeering. After short speeches by four BJP leaders before him, Paripoornananda took the mic amidst cheers of ‘Bharat Mata ki Jai’ and ‘Vande Mataram’. He began his speech with slogans of Bharat Mata, and claimed that he owed an answer to the society, which has protected him all through his life. He said that he chose to begin his political campaign in Kamareddy as he learnt about ‘spiritual life’ there. The seer narrated that when he was 15-years-old (1987-1988), his parents ‘dedicated him to dharma’ and he joined the Arsha Gurukulam in Kamareddy. 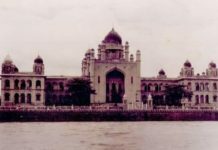 He alleged that Telangana caretaker CM K Chandrasekhar Rao chose to go to polls early citing lies, even though people elected him for a full tenure of five years. “One wants to give 12% reservations to Muslims another wants to bring Jesus state. Are Hindus fools? Will we allow that to happen? Shouldn’t we show them?” he asked, provoking the crowd, who cheered loudly. 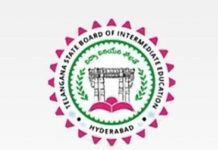 Paripoornananda was referring to the TRS government’s decision to hike reservation quota for backward Muslims in the state to 12%. The ‘Jesus’ jibe was aimed at Congress leader Uttam Kumar Reddy, who, in a recent meeting, reportedly said that their government would work to ensure reservations in jobs to Dalit Christians. Stating that the battle in Telangana this time was for dharma and corruption-free rule, the seer also spoke about the time he was externed from Hyderabad. 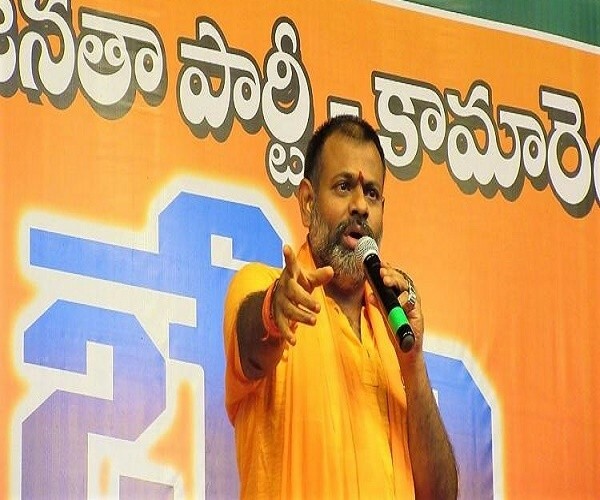 In July this year, Paripoornananda, the founder of the Rashtriya Hindu Sena, was kept under house arrest at his bungalow in Hyderabad’s Jubilee Hills, before he was banned from entering Hyderabad for six months without prior police permission. The police submitted various videos of his speeches and stated that the seer attempted to create a communal divide, disturbing public peace. ALSO READ: Why Are Pests Developing Resistance To Cotton Crop In Telugu States? At the rally, Paripoornananda’s speech seemed to be a hit among the youth who had gathered. Many even rushed to touch his feet and take blessings after the gathering. Is the situation in Kamareddy in favour of the BJP? Kamareddy has over 2.15 lakh voters, and while analysts say that the fight is likely to be between Congress’ Shabbir Ali and incumbent TRS MLA Gampa Govardhan, the BJP has established its presence with this meeting and Paripoornananda’s speech. Gampa Govardhan was the chief whip of the TRS in the Telangana Legislative Assembly, and former Minister Shabbir Ali was the Leader of Opposition in the Legislative Council. Thursday’s event unveiled the political persona of Paripoornananda, and also indicated that BJP’s candidate Katipally Venkataramana Reddy may have a shot at the seat. Reddy began his political career in Congress as a local body leader and became a Zilla Parishad Chairman in united Nizamabad district in 2009. Several people who gathered for the speech seemed to be curious about what Venkataramana Reddy had to offer. Rajalingam, a farmer in his early 60s, came from neighbouring Chinnamallareddy village in an auto arranged by a local BJP leader. “Who knows who will come to power now. Shabbir Ali lost his seat long back and he is trying hard to come back, but the BJP candidate is also frequently visiting the villages,” he said. ALSO READ: Is Prime Minister Misusing Democratic, Constitutional Powers Against Andhra Pradesh Political Adversaries? Around 40 men from Sangameshwar of Domakonda mandal, most of them farmers, also attended the meeting, stating that they were ‘asked’ to do so by local BJP leaders. When asked if he planned to vote for the BJP, he said that he was not sure yet, and was still observing. When asked about any promises that were made, he said, “We started constructing a temple for our community goddess, but it got stuck halfway. The local leaders told us that they will make sure that the construction is completed if we vote BJP’s candidate to power.” Others around him nodded in agreement. Can the BJP make inroads? The BJP seems to be confident, and is banking on anti-incumbency, among other factors, for a win at the local level. 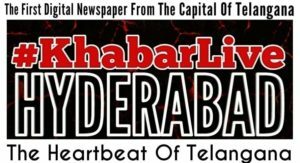 In a conversation with #KhabarLive, Bharatiya Janata Yuva Morcha (BJYM) District General Secretary Narender Reddy said that they were sure of a win. Next article#BigQuestion: Is Chandrababu Naidu The ‘Game Changer’ In Indian Politics?